Does my natural hair offend you? Is it not neat enough, bouncy enough, straight enough? 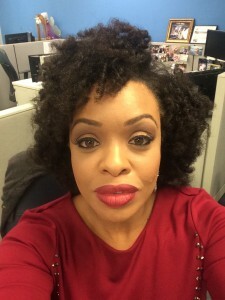 Three weeks to the day of my natural hair reveal on air as a local news anchor, and the first “I hate it” message came into the newsroom. That, my friends, is a pretty big deal in television. I received an email during the first week saying my afro belonged in the 60s but I thought that was funny. This one did not provide comic relief. The sender thought we should know exactly how he felt about my natural hair on his television. Eddy B. has a right to his opinion, and I’ve braced myself already for moments like this, even before the decision to go natural. I won’t bore you with the list of “offenses” I apparently bring just by being on television. I’ll spare you the sob story of hateful emails just for existing some days. That’s because I’m not alone and I chose to have a job in the public spotlight. You will hear unwanted feedback on everything from your race, to your name, your lipstick choice or clothing, the way you pronounce a word, over enunciating, not articulating enough, you name it. What we learn early on in this business is to have tough skin. I won’t say we become immune to hatred or negative comments, we are just prepared. Eddy’s email was mild. Hey, he even gave me a compliment. “She is a capable reporter,” he wrote. Capable. I’m glad he sees my potential after more than a decade as a reporter/news anchor, 8 of those years on his television. To be honest, that’s the line that stuck with me. He’s always seen me as “capable.” Does my new look somehow make me less “capable” or credible? Why is natural hair so offensive? I ended by wishing Eddy a blessed day. I know I did not have to justify wearing my natural hair or even explain myself. I just thought I’d educate him a little bit. Sometimes you have to take the bad with the good. I choose to focus my energy on the good. You are gorgeous sis, as is your hair. I admire you for what you do and the grave with which you do it. It disgusts me that anyone would have such strong objections to your hair that they then have the gall to share. It must be hard to rise above the haters & smile with their nonsense on your brain. But you’re doing it well. Your natural hair looks great. Glad you made the change.